KS Fitness has the finest personal training staff in the area. Not only do we have some of the brightest and most talented recent graduates of national certification or college programs in personal training, we also have personal trainers with highly visible national profiles, advanced degrees and several publications to their credit. All of our trainers are certified with yearly continuing education credits and CPR certified. Above all our trainers are friendly and personable and get to know you while expertly educating you and motivating you to be your very best. 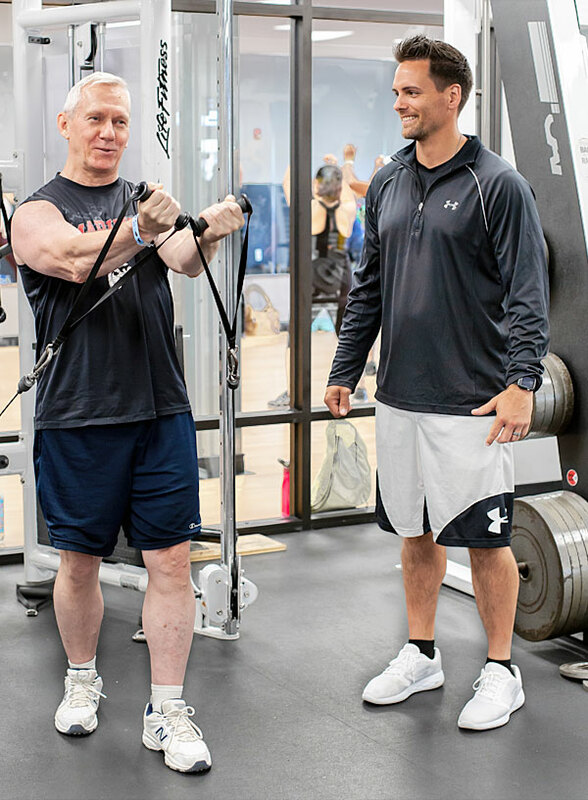 Master trainers like Dan Gallagher have developed a following in the community, design programs, and can work with a variety of injuries using post-rehabilitative protocols. Allow Dan to use his years of experience and multiple certifications to maximize your training and bring you to the next level. Level 1 trainers have a nationally credited certification and fully trained with a comprehensive knowledge of anatomy, kinesiology, injury prevention, supplementation and nutrition, fitness evaluation, exercise prescription, and all aspects of resistance training. Level 2 trainers: All of the requirements of Level 1, plus advanced academic degrees and or multiple certifications. Master Trainers have extensive expertise and experience, multiple certifications, and specific, advanced training techniques to help their clients achieve maximum performance and stay injury free. Master trainers have developed a following in the community, design programs, and can work with a variety of injuries using post-rehabilitative protocols. Get absolutely FIT in just 8 weeks! Only $239 for 8 weeks! Pick your favorite trainer and convenient training time to transform your body from inside out. Your trainer will contantly introduce new training techniques and routines to accelerate your results. Your body will never plateau and you will never get bored. You will increase your metabolism and sculpt your body the way you always wanted. Kick start your fitness level to another height. One great trainer and a maximum of 4 per group equals results! Please inquire at the front desk or call 732-349-5959 for details. GRAVITY is a fun and innovative program that provides full body conditioning through resistance training or Pilates. Your training sessions are in small groups and monitored for maximum results in just 30-45 minutes. Includes Group Personal Training, 16 classes per week, 6 types of classes, and Stop Light Weight Loss Program. GRAVITY’S training system bench engages all muscle groups and encourages functional exercises for any age groups by using your own body weight as resistance against GRAVITY. This is accomplished by simulating functional movements performed in the course of everyday life, achieving improved performance. GRAVITY adjusts to 8 different levels of resistance, and more than 250 different strength, stretching, and Pilates exercises. Unlimited Gravity Classes Only $29.99 per month!